Otley Run Fancy Dress Blog A cosplay and fancy dress blog from one of the UK's leading costume retailers. With the release of BioShock Infinite on Tuesday has brought with it a black out on social opportunities for me. None of my friends are answering phone calls, emails or text messages. Instead they’re all glued to the latest release in the BioShock series and, according to the reviews I’ve read, with good reason. Instead of picking it up for myself (the reason for which will be made clear shortly) I’ve been working hard on the retail website and thought it appropriate to do a BioShock cosplay feature piece. I’m guessing that over the next few weeks and months we’ll get an influx of new Infinite themed cosplay pictures but until then I’ll be looking at the best so far based on all 3 games. 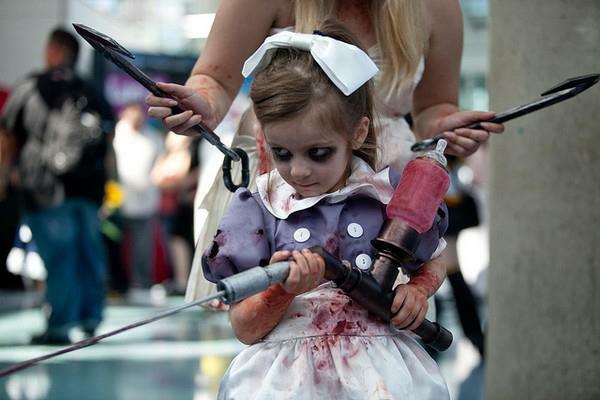 For anyone who hasn’t seen any BioShock cosplay pictures in the past you’re in for a real treat. Not only are the costumes incredible but the locations that they’re shot in make these some of the very best cosplay shots I’ve ever seen. I must also disclose that my experience with the game series is very limited. I own the first and second games but due to working commitments (insert sob story here) I’ve had very limited time to play them. I picked them both up based on a recommendation from a friend who was adamant that they’re some of the very best games he’s ever played. Following on from his recommendation to play Far Cry 3 I took his words as gospel and snapped them up straight away. OK, enough of my inability to sit down and play through a game series. Let’s get into some cosplay. Before we delve into some cosplay pictures I think it’s only right to check out a review and some footage from Infinite (for the benefit of those who have never played any of the games or for those of you looking forward to getting it). Thanks as always goes to the team over at IGN. It’s true that there are few Infinite themed cosplay pictures out at the moment but we expect that to change very soon. Once more become available we’ll be sure to feature them also. Thankfully one young lady named Anna Moleva got the jump on everyone and released a wonderful photo set back in 2011 featuring her Elizabeth costume, which then lead to her being employed by BioShock developer Irrational games to help with Elizabeth’s character art. It’s a lovely story and one that should give hope to anyone looking to take their costume work further. I’m going to start by featuring the original pictures that got her noticed by the Irrational Games team before showing a video that explains how the final character was developed. She then did another shoot with an updated version of the character. You can see the rest of the pictures from this shoot via the source link below the picture. The similarity between Anna and the character Elizabeth (demonstrated in the side by side pictures below) is uncanny. Anna replicated the character near perfectly and this attention to detail didn’t go unnoticed. Congratulations must go to her for her involvement in developing the character for the game, which is highlighted in the video below. If you’re planning on doing your own BioShock cosplay costume and would like it to be featured here it would be my pleasure to do so. Please get in touch with me here and include links to your pictures if you’ve already got them uploaded to sites like Deviant Art or Flickr. If you haven’t uploaded them anywhere else yet I’ll happily roll out the red carpet for you so that you can announce it to the world! Many of you will already have seen the pictures from this shoot either on Deviant Art or featured in countless cosplay articles but it’s well worth featuring them again to remind you. Shooting at such a fantastic location makes me very envious as a photographer and the final shots are a wonder to behold. The shoot took place at the Giorgia Aquarium, which was until December 2012 the worlds largest aquarium. Having a backdrop like this propels the shots from being good to great, as you can see from the final pictures below. This series of shots stars cosplayer Monika Lee as Little Sister with photography by Benny Lee. He also released this teaser showcasing a group of BioShock cosplayers playing a variety of characters. Along with the picture Benny also teased that a new set of BioShock cosplay shots are coming soon, which will feature these cosplayers. To keep up to date on the latest on this project check out his Deviant Art page here. Although the quality of the shots and the location make the Benny and Monika series one of the best I’ve seen I still have a soft soft for the following excellent series of shots. Here’s a showcase of the other BioShock costume pictures that I’ve found including a great set of shots from Paula (thecrystalshoe on DA), who I’ve featured before. With all the adult cosplayers featured above I thought it was only right to feature a little girl dressed as Little Sister. I love this picture and hope it’s a fitting way to finish this piece. I won’t have a chance to pick up and play BioShock Infinite any time soon but would love to hear what you all think of it. I’ll finally get round to playing the first two in the series over the next month but would also love to hear what your thoughts are on any of the games. Which one is your favourite and why. I do ask one thing though….NO SPOILERS PLEASE! See, I asked nicely. I’d also love to see more new Infinite related cosplay so if you see some soon please send me the link either via the contact us page at the top or in the comments section below. The owner of Otley Run Fancy Dress and a fancy dress guru. He's also an amateur photographer who has experience with cosplay and costume photography. © Copyright 2011-2013 Otley Run Fancy Dress All Rights Reserved.